Don’t ask how I stumbled upon this video. It isn’t a bad cover of Joan Baez/Led Zeppelin’s tune (more Led Zeppelin’s version than Joan’s original), but there is something just not quite right. If you are not familiar with myrareguitars.com today is your lucky day. My pal Jason turned me on to them years ago, and they have grown and grown releasing all these amazingly cool looking retro guitars at really reasonable prices. I was cruising the site today and came across this awesome “Country” guitar, which just looks really classic to me. They have also release a snappy little lapsteel which you can’t beat for $400! Bass players don’t fret (nyuck nyuck) check out this super cool EEB bass that comes in a fretless version. Many moons ago there was a band in Tucson Arizona named appropriately Barely Bi-Pedal. The band was a loose conglomeration of musicians which revolved around Tucson misfits James Jordan and John Mount. During it’s heyday in the late 80’s and early 90’s I was involved in the project, playing bass, recording the band on 4 track, and adding lo-fi experimental noise effects. It was a great free time, and I remember it fondly. The band was completely free of any restrictive structure, and everyone could write songs or do whatever they wanted basically. The result was a string of really interesting cassette only releases that are pretty much the stuff of legend, and have inspired some rather fanatical devotion. The music was somewhat country/folksy, with a somewhat drug assisted psychedelia. So many great musicians were in that band it’s hard to remember them all, but at it’s core it always seemed somewhat like the Velvet Underground with Nancy Pontious cast in the role of Nico. Fast forward 20 some odd years and Nancy has been busy with her own musical endeaver titled Project Bluebird. Nancy has waged her own personal war and peace with various illnesses, and the drugs that go along with that a large part of her life, but she continues to churn out her own unique art and music. She works with many different musicians (many of them named Eric), and in homage to the old sound of Barely Bi-Pedal, imperfect and low-fi, I added a bunch of loose instrumentation to this lovely spacey song of hers entitled “I Am”. Check out Project Bluebird and some of the other people Nancy makes music with. Well actually it is more like the robot guitar is dancing and singing along to Mari’s performance. She has created a patch for the cycling ’74 software Max MSP which is responding to the different pitch in her performance. The software then sends commands to her robotic partner resulting in this beautiful performance. Mari is also known for her physics defying subharmonics. Judas Priest definitely reside among the Gods in the in the Pantheon of modern metal. The modern heirs to the throne built by Black Sabbath, they came from the same town and Priest even rehearsed in the same room once rented by Sabbath. Apparently before they pioneered the gay leather look that really defined metal they tried this “let’s look just like Led Zeppelin approach”. The leather really toughed up the sound it seems as well! So I’ve added a section “Portland Bands” to list some of the great bands I’ve been seeing here since moving. Portland has a number of different thriving music scenes currently, as well as lots of great places to see bands. 4th of July we (Lana Rebel and the Broken Promises) played a really fun house party (Mary’s Annual 4th Party) There were a number of other great bands on the bill, but the one that made the biggest impression on me was Lord Master. When they were setting up it was hard to tell what to expect…a double stack of vintage National amps! Well to keep it short I’ll just say that they play a mixed bag of smart ironic rock fused with some really great metal guitar riffs, topped off with fun snarky lyrics ( a metal song about a bodybuilder etc). All in all really great stuff. Other highlights were the Birds of War, fronted by a couple of Portland veterans James Curley and Dylan Reilly whom I knew from way back in the days of punk rock in Tucson AZ. The Birds ripped through an admirable set of vintage punk rock which would appeal to fans of Black Flag or The Minutemen…the real stuff. Dylan was pleased to report his dad has finally realized that he is indeed an excellent bass player after seeing the performance. In between these bands were Thee Headliners…who are just too damn good. 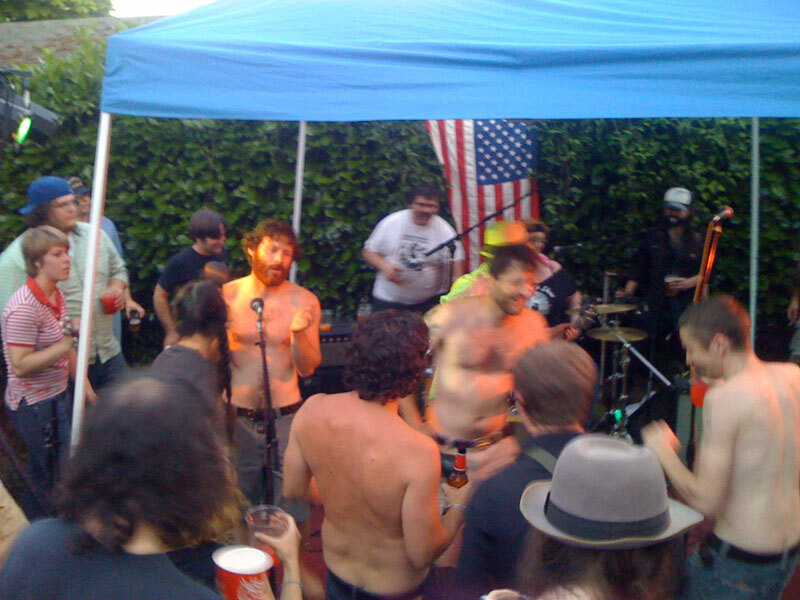 They had the drunken revelers all torqued up into a sweaty frenzy that culminated oddly enough into a sweaty shirtless man jam…I snapped a camera phone picture of this display featuring none other than apple of our gal Lana’s eye Kevin Mayfield banging his tambourine and singing along during a Creedence cover of Proud Mary. The Slide-piano Log, the Percussion Guitar, the Electric Pancreas, the Vatican, & the Pedal-action Wiggler; or rare: Autoharp, Glockenspiel, Toy Piano, & Viking Rowboat. I’m going to harbor a guess it was the Pedal Action Wiggler? It looks like a bow attached to a hi-hat stand and it sounds somewhat like a didgeridoo as he pumps the hi-hat pedal, flooding the world with a monstrous bass tone. There was an entertaining number about the “Last Human Being” which i believe may have replaced the theatrical “Cockroach” number which was a personal favorite from the past. I greatly enjoyed the “Old Grey Heron”, a song written by Dan and introduced in a humorous manner as a song he had written for his father after he passed away, except he hasn’t passed away yet, and he continues to live on at the ripe old age of 88. You still have a few chances to catch this monster of a band as they finish their NW tour down the coast.